Every time I come back to Taiwan I experience some kind of identity crisis. It's like I have two parallel lives that continue simultaneously. The minute I walk off the plane in Taoyuan I feel as though I never left Taiwan. Taipei has changed--new buildings have sprung up, new restaurants opened their doors, more department stores opened next to already existing department stores. I wasn't here for any of that--yet I feel like I was. I feel just as home here as I do back in LA or Fresno. However, physically it takes me a few days to adjust. First and foremost, the problem of jet lag. Jumping from one time zone to another still messes with my body no matter how many times I've done it. I fall asleep at 8pm and wake up at 6am. I usually don't sleep till past midnight and wake up around noon. Secondly, the weather. Unfortunately, the few days after we landed, Taipei got hit with the worst sandstorm in history thanks to some dirty sand blowing over here from China. It was hot and humid for a few days and then it was cold and windy--definitely not good for the body. People are getting sick left and right. I'm a bit of a germaphobe. I've been trying not to breathe in too deeply haha. Lastly, the food. I guess my body is used to a "Californian" diet. Unless I'm treating myself to a good meal at a good restaurant, my diet is usually low in fat and low in carbs. I eat a lot of salads, grilled chicken breasts, and granola. When I'm in Taiwan we don't waste a single day in enjoying the food here. Suddenly, I'm eating all this delicious, fatty, carby, rich food as fast as I can and my body was NOT at all ready for it. As a result, I had to sit out a few meals. That's what I get for being a glutton. A week later, I think I'm perfectly adjusted again. Just in time for a fabulous meal. Even before we landed in Taipei, my dad (who luckily shares my enthusiasm for food and wine) has been talking to me about the new restaurants that have opened in Taipei since I was here last summer. He kept mentioning the name "Abu." I kept picturing the monkey from Aladdin. Confused, I did some research. Apparently, Chef William "Abu" Bu moved to Taipei about 11 years ago after starting his career in the kitchens of the Hilton Hotel in Hongkong. He then got sent to France and Italy for further training. He began in Taipei at the Caesar Park Taipei and then worked at Tutto Bello Restaurant, an Italian restaurant beloved by many in Taipei. After closing down his brasserie behind The Sherwood Taipei, Abu opened an eponymous new 40-seat restaurant near the RenAi circle last April which has quickly garnered a loyal following. If I lived year-round in Taipei, I would be one of those loyal followers. My family and I had lunch at the restaurant yesterday on a whim. My dad made a call and we were given the private dining room in the basement. Though the room was a little big for just the four of us, it was nice and private. However, as a result, I didn't get many pictures of the restaurant itself. My dad had to make a business meeting so he had to leave before the rest of us. He had about 45 minutes to dine and the restaurant was VERY accommodating. They created a smaller set menu just for him and the food came out very quickly. The rest of us had an extremely enjoyable leisurely meal that consisted of a whopping 5 course lunch set priced from NT 1,000 to 2,000 (around $30 to $60) depending on what you order as your entree (cheapest being the pasta and the most expensive being lobster). 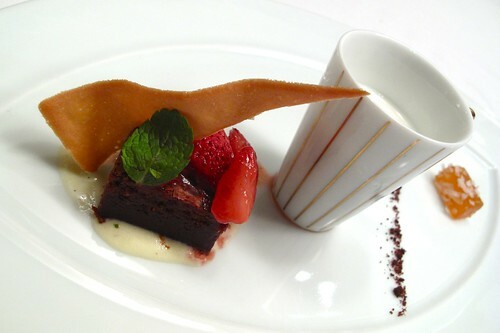 The set included an appetizer salad, a soup, main course, and two desserts. 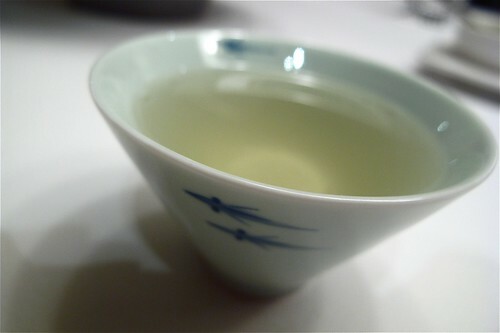 The minute we sat down we were offered a welcome cup of "Eastern Beauty tea." Did it make me more beautiful? Maybe not, but it was a nice touch. 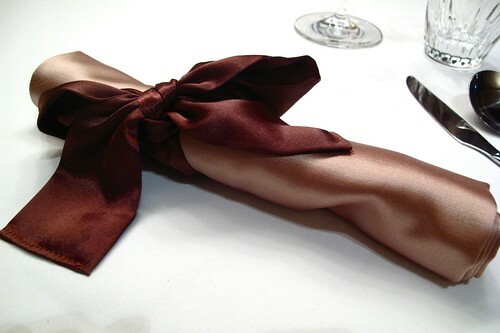 Very fashionable satin napkin tied with a big brown satin bow. Love. 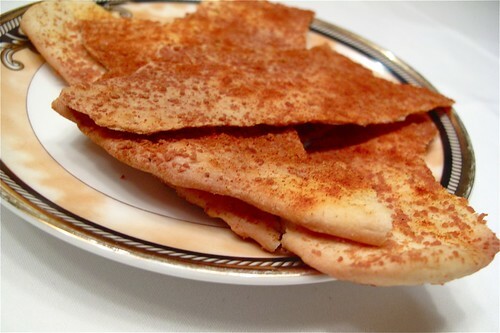 Some kind of crispy flatbread that my brother devoured in no time flat. Must have been tasty. Absolutely marvelous bread basket that was so diverse. 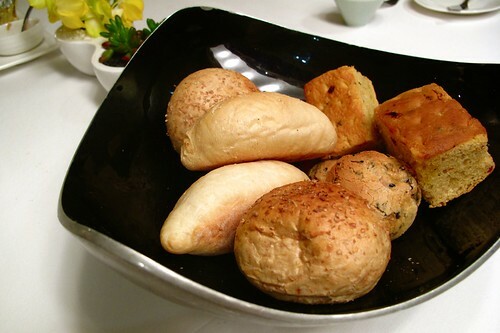 It had at least five different kinds of breads including a french roll, focaccia, wheat roll, a sesame mochi bread that is really popular in Taiwan right now, and a raisin walnut bread. All were delicious. I had to keep reminding myself that none of the courses had even arrived yet! 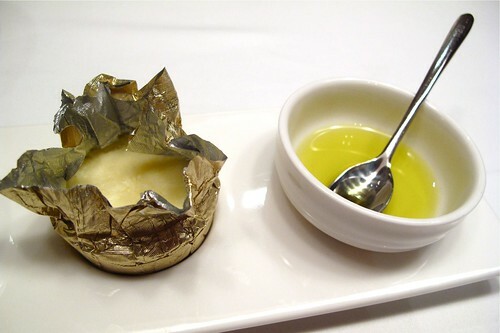 Wonderful salted butter that took me back to France and fruity olive oil. The butter went well with the french bread and the olive oil with the focaccia. A pleasant tuna spread although I was hoping for some kind of pork/duck rillette. My mom ordered this salad. It looked delicious enough though I didn't get a chance to try any of it. There were two big pieces of shrimp hiding under that mound of foam. I loved this salad. 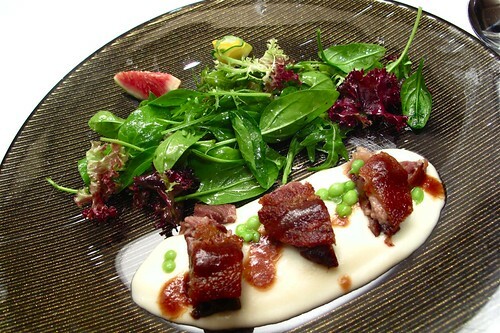 The confit was nice and tender with a crispy skin and wasn't overly salty. There also wasn't too much of it. Duck confit can get a little heavy. The bed of potato underneath the duck was more of a potato puree than a standard mashed potato. It was light and airy. I also loved the sprinkling of petit pois. Each pea was a sweet little burst of flavor. 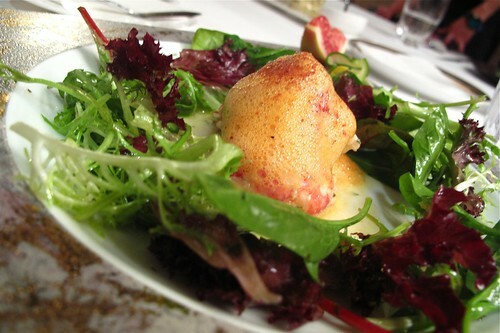 The salad was dressed simply in olive oil and lemon. A piece of fresh sweet fig topped off a very well balanced salad. This was perhaps my favorite course of the whole meal. It was beautifully presented--with the soup being pour over the creme brulee at the table. 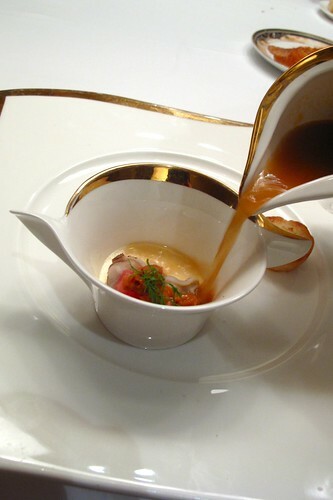 The consomme was sweet from the seafood and the salmon creme brulee added a nice creamy touch without being overly heavy. 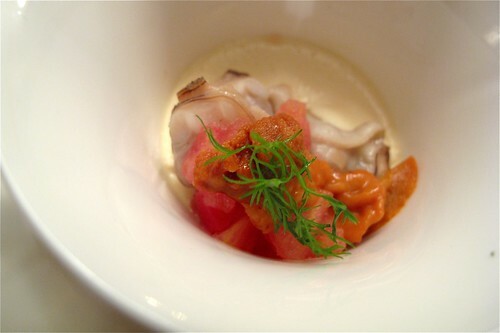 I love sea urchin and I love clams so it was the perfect dish for me. I ordered this as my main dish because the restaurant names this as their signature dish. Sadly, I was not impressed. 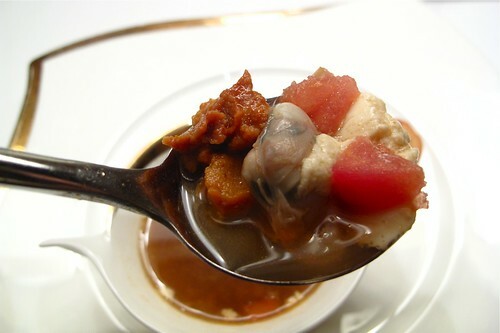 Although it was very tender, it was lacking in flavor. It was pleasant, just not amazing. The whole time I was eating it I was hoping for a piece of pot roast from Jar--not a good sign. 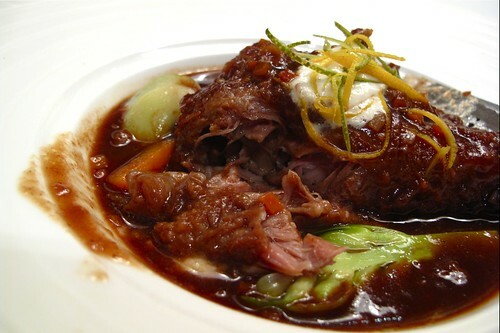 The beef cheek was just as tender as the veal shank but it packed a bigger punch of flavor. 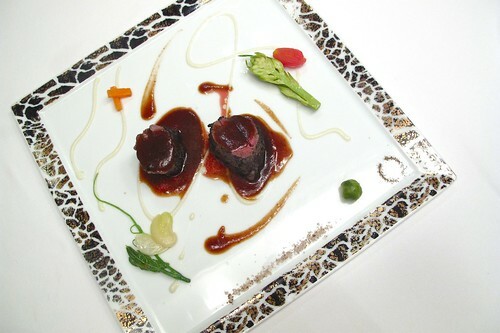 I would definitely choose this dish over the veal. The red wine sauce was not too heavy either. 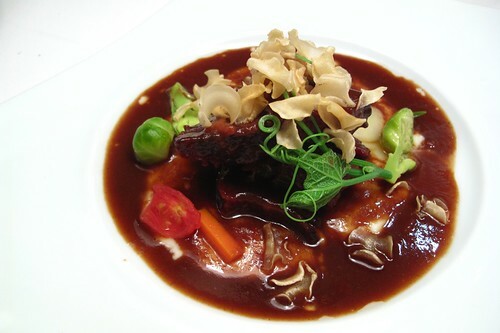 The beef cheeks were on top of a bed of potatoes similar to those from the confit salad and topped with a sprinkling of fried mushroom slices. Perfectly portioned. 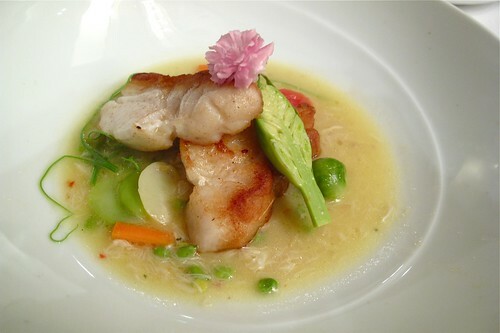 This dish was beautiful--asthetically and flavor-wise--topped with an edible flower. Although I'm not sure what Hump Head Fish is--other than it being a white flaky fish--it was tender and reminiscent of cod. The crab meat sauce paired with it beautifully. I'm not quite sure how this dish was prepared. I would think that perhaps they meant sous-vide when the menu said steamed (English menu translations can be a little funky here) but I don't want to make any assumptions. Perhaps the tenderloin was literally steamed and then grilled. Either way, it was tender and perfect with the line of truffled sea salt on the plate. One of the best panna cotta I've ever had. The slightly tangy mango sauce went so well with the creamy panna cotta. It was perfectly sweetened. 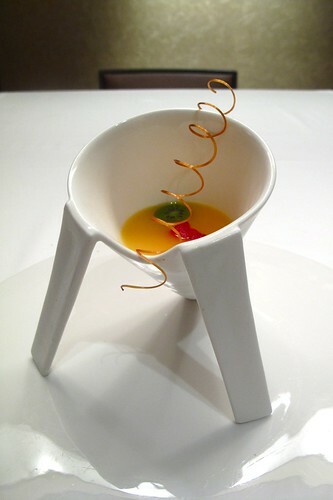 It was served in this interesting device--like a ceramic snow cone with legs. I loved it. Not a big fan of this one. I could've done without it. The brownie was not chocolatey enough at all--in fact it was very bland. The strawberry sauce didn't help it. The almond milk seemed out of place. The fruit pate seemed like an after-thought. Overall, not as successful as the first dessert. Coffee was served with dessert and it was good coffee. Bad coffee is the worst. 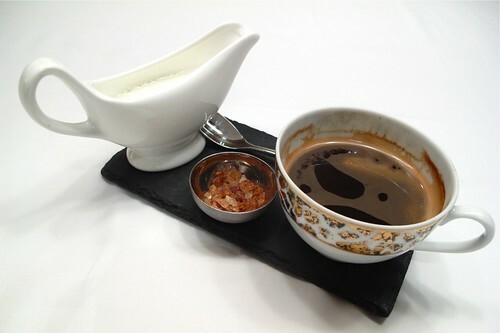 I think the quality of coffee at a restaurant actually says a lot about the quality of the restaurant itself. Chef Abu has been in the kitchen every day since the restaurant opened last April and I'm glad I got to try his dishes. His concern for his food shows in the beautiful plates of food we were presented with. It is no surprise to me that Abu has the reputation of being a chef who is driven by an ambition to serve Michelin star worthy cuisine. I really enjoyed reading! And everything looks so delish! Wow! This looks superb! I haven't been to Taiwan since 1997! You should visit. Taipei is so much fun! Nice article. We were at Abu the night of March 27th. This is our favorite restaurant in Taipei (well, Robuchon is right up there too) so we celebrated our wedding anniversary there - I love Abu's signature souffle (it takes 3-4 staff to carry it out on its own table). I had the steamed truffled tenderloin, which I understand is truly steamed. 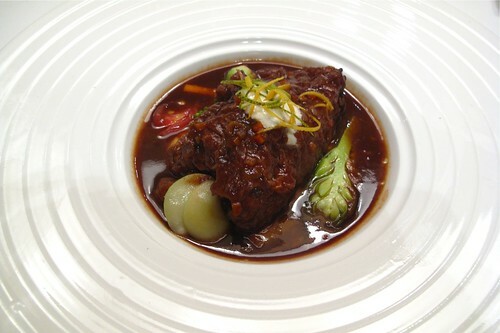 My husband had the Wagyu beef cheeks and they were divine. 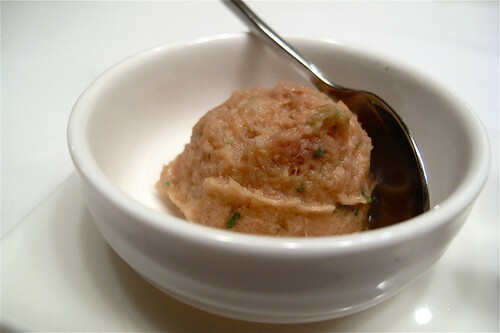 I agree with the tuna spread - he used to have an excellent eggplant caviar that he even sold by the jar. I didn't see any this time around. Abu is very good to us and spoils us so we are are actually going back again next week for my bday! BTW, I'm a California Expat(LA and Sacramento) here in Taiwan now working as a food and travel writer. Just ran across your blog so I will have to check it out as I notice you have similar Cali ties! Sadly, my own blog has been neglected - working on getting it updated now. As an update Abu has opened another restaurant in Taipei, more affordable but still a great place to eat, it's called Abu Brasserie.